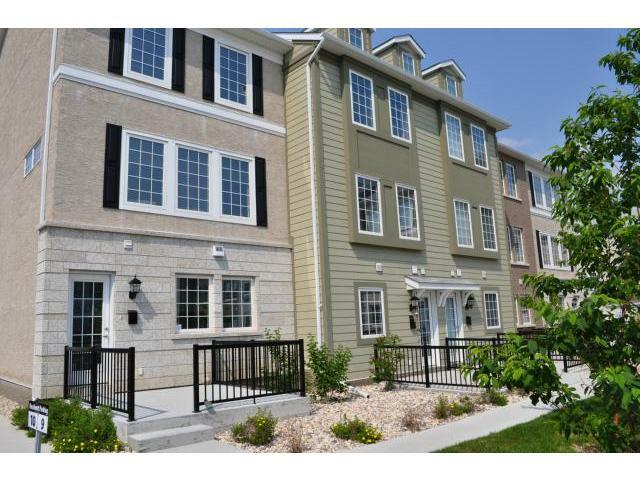 Nicely located end unit in the heart of Bridgewater Forest Condominiums over looking center courtyard. Larger then most at 1747 S.F. This includes an attached double car garage and Geo Thermo Heating unique to this one unit. Modern and fashionable decor with open concept kitchen, dining area and lounge space over looking courtyard from second floor. Kitchen boasts stylish grainy brown cabinetry, sleek grey stone counters and high end appliances. One of 3 bathrooms just off kitchen. Leave the dining area onto a second floor deck over the garage with frosted glass privacy railings. Main floor has den area with bar top and wine chiller. Third floor hosts 3 bedrooms with full bathroom and master bedroom with walk in closet and full ensuite bathroom. Such low condo fees and did I mention the Geo Thermal heating?! This might be the nicest condo in all of Bridgewater Forest!